Full Price: $ 108.00 18% off! 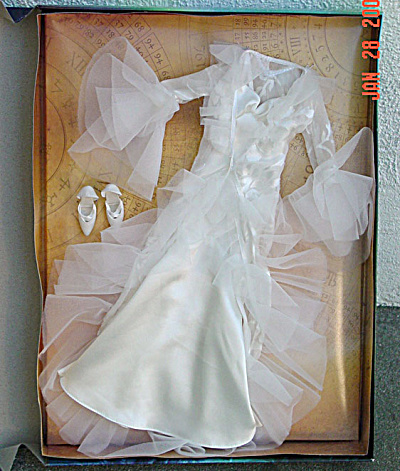 2007 Robert Tonner Tucking In outfit only for the 16 inch Mrs. Coulter Doll Figure, No. T7-GCOF01, is from the New Line Cinema film, The Golden Compass. This lightweight fitted white satin sleepwear lingerie set includes a sheer peignoir nightgown that is lavishly adorned with translucent ruffles; and white shoes. Since Mrs. Coulter's body is based upon the Tyler Wentworth dolls, this outfit may also fit them and other dolls that use the Tyler body. This outfit is new and mint-in-the-box with shipper. Limited edition of 500. This price is for the outfit only and does not include the catalog doll that is modeling it. This item is on sale for a limited time at a greatly reduced price. Expand for the to view the photo of the outfit in its box and both catalog photographs of a doll modeling it.